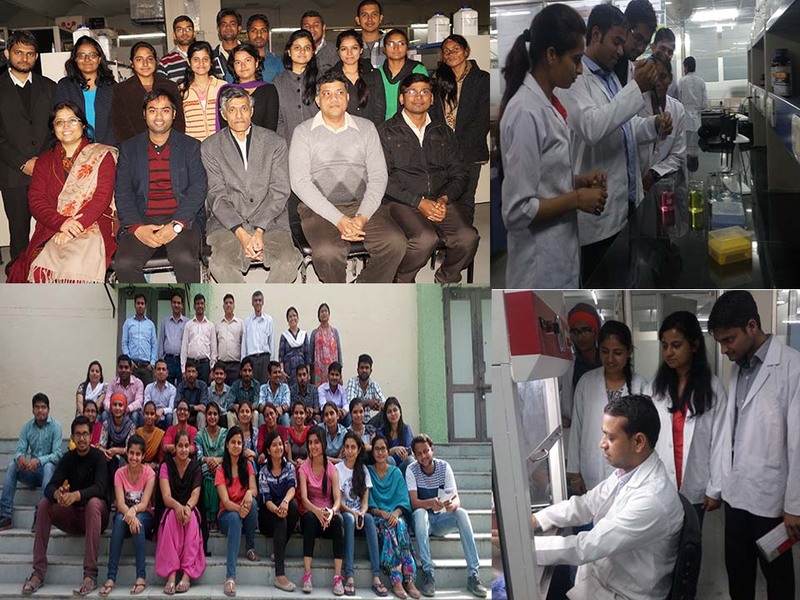 Provide state of the art educational and research training for students. Provide students excellent opportunities to explore the dynamic fields of biomedical including clinical biochemistry, immune-pharmacology, immunology, and drug research. Gupta, K.B., Upadhyay, S., Saini, R. G., Dhiman, M., Inflammatory Response of Gliadin Protein Isolated from Various Wheat Varieties on Human Intestinal Cell Line. Journal of Cereal Sciences (Under minor review). R. Kaur, Rubal, Dhiman, M., Vashitstha R., Munshi A. (2017) Serum Albumin Levels in Breast Cancer: Correlation with Overall Survival. J Food Nutr Disor 2017, 6:5. Zago M, Hosakote Y, Dhiman M, Piñeyro M, Parodi-Talice A, Basombrio M, Robello C, Garg N (2016) TcI isolates of Trypanosoma cruzi exploit antioxidant network for enhanced intracellular survival in macrophages and virulence in mice. Infection and Immunity, 84(6):1842-56. Impact Factor 3.6. Gill I, Kaur S, Kaur N, Dhiman M, Mantha AK (2017) Phytochemical Ginkgolide B attenuates Aβ(1-42)- induced oxidative damage and altered cellular responses in human neuroblastoma SH-SY5Y cells. Journal of Alzheimer’s Disease. doi: 10.3233/JAD-161086. Impact Factor 3.7. Dhiman, M. and Garg, N. J. (2014) P47phox-/- mice are compromised in expansion and activation of CD8+ T cells and susceptible to Trypanosoma cruzi infection. PLOS Pathogens. Impact Factor 8.4. 2017: Prof AR Rao Memorial Young Scientist Award from Society for Mitochondrial Research and Medicine (SMRM) organized by the Jawaharlal Nehru University (JNU), New Delhi, India 10-11 February 2017. Merit certificate for commendable work in Community Development Cell on 8th Foundation Day of Central University of Punjab, Bathinda, February 2017. Shishir Upadhyay, Kunj Bihari Gupta, Sukhchain Kaur, Rubal, Sandeep Kumar, Anil K. Mantha and Dhiman M* (2017). Resveratrol: A Miracle Drug for Vascular Pathologies Functional foods and Human Health". Springer Publishers. Sawaya MR, Verma M, Balendiran V, Rath NP, Cascio D, Balendiran GK (2016). Characterization of WY 14,643 and its Complex with Aldose Reductase. Scientific Reports 6:34394. Mondeel TDGA, Rehman S, Zhang Y, Verma M, Dürre P, Barberis M, Westerhoff HV (2016). Maps for when the living gets tough: Maneuvering through a hostile energy landscape. IFAC-PapersOnLine 49-26: 364–370. Bragg S, Verma M, Moser RJ and Balendiran GK (2015). Kinetics of the Solid State Pyrolysis of Gellan Gum and Paper Pulp. Journal of Biobased Materials and Bioenergy Vol. 9, 1-8. Balendiran K, Ganesaratnam, Rajendran Pandian, J., Drake, Evin, Vinayak Anubhav, Verma M, Cascio Duilio (2014). B-factor Analysis and Conformational Rearrangement of Aldose Reductase. Current Proteomics 11(3): 151-160. M Verma, EG Karimiani, RJ Byers, S Rehman, HV Westerhoff, PJR Day (2013). Mathematical modelling of miRNA mediated BCR-ABL protein regulation in chronic myeloid leukaemia vis-a-vis therapeutic strategies. Integrative Biology 5(3): 543-54. M Verma, M Zakhartsev, M Reuss, HV Westerhoff (2012). ‘Domino’ systems biology and the ‘A’of ATP. Biochimica et Biophysica Acta (BBA)-Bioenergetics 1827(1): 19-29. HV Westerhoff, M Verma, M Nardelli, M Adamczyk, K van Eunen, E Simeonidis (2010). Systems Analysis of Metabolism. Biochemical Society transactions 38 (part 5): 1189-1196. HV Westerhoff, C Winder, H Messiha, E Simeonidis, M Adamczyk, M Verma, FJ (2009). Systems biology: the elements and principles of life. FEBS letters 583 (24): 3882-3890. M Verma, HJ Martin, W Haq, TR O'Connor, E Maser, GK Balendiran (2008). Inhibiting wild-type and C299S mutant AKR1B10; a homologue of aldose reductase upregulated in cancers. European journal of pharmacology 584(2): 213-221. M Verma, PJ Bhat, KV Venkatesh (2005). Steady-state analysis of glucose repression reveals hierarchical expression of proteins under Mig1p control in Saccharomyces cerevisiae. Biochemical Journal 388 (Pt 3): 843-849. A Ruhela, M Verma, JS Edwards, PJ Bhat, S Bhartiya, KV Venkatesh (2004). Autoregulation of regulatory proteins is key for dynamic operation of GAL switch in Saccharomyces cerevisiae. FEBS Letter 576(1-2): 119-126. M Verma, PJ Bhat, KV Venkatesh (2004). Expression of GAL genes in a mutant strain of Saccharomyces cerevisiae lacking GAL80: quantitative model and experimental verification. Biotechnology and Applied Biochemistry 39(1): 89-97. M Verma, PJ Bhat, S Bhartiya, KV Venkatesh (2004). Steady state modeling approach to validate an in vivo mechanism of the GAL regulatory network in Saccharomyces cerevisiae. European Journal of Biochemistry 271 (20): 4064-4074. M Verma, PJ Bhat, KV Venkatesh (2003). Quantitative analysis of GAL genetic switch of Saccharomyces cerevisiae reveals that nucleocytoplasmic shuttling of Gal80p results in a highly sensitive response to galactose. Journal of Biological Chemistry 278 (49): 48764-48769. Fong KP, Pacheco CM, Otis LL, S Baranwal, Kieba IR, Harrison G, Hersh EV, Boesze-Battaglia K, Lally ET. (2006) Actinobacillus actinomycetemcomitans leukotoxin requires lipid micro domains for target cell cytotoxicity. Cellular Microbiology 8(11): 1753-67. Impact Factor 5.62. Mishra A, Kumar S and Pandey AK. (2013). Scientific validation of the medicinal efficacy of Tinospora cordifolia,” Scientific World J, 2013, Article ID 292934. Mishra A, Sharma AK, Kumar S, Saxena AK and Pandey AK. (2013). Bauhinia variegata leaf extracts exhibit considerable antibacterial, antioxidant and anticancer activities. BioMed Res Int, 2013: Article ID 915436, 10 pages. Kumar S, Sharma UK, Sharma AK and Pandey AK. (2012). Protective efficacy of Solanum xanthocarpum root extracts against free radical damage: phytochemical analysis and antioxidant effect. Cell Mol Biol, 58, 171-178. Kumar S and Pandey AK. (2013). Chemistry and Biological Activities of Flavonoids: An Overview. Scientific World J, 2013,Article ID162750. Dhiman, M. Mitochondrial Oxidative DNA Damage-Repair in Alzheimer’s disease: AP-endonuclease (APE1/Ref-1) as a Potential Therapeutic Target. Funded by DST, New Delhi. Co-investigator (46 Lakhs) (2014-17). Last modified: January 15 2019 11:55:10.